1. Cook the spaghetti according to package instructions. Drain and set aside. 2. Cut up the bacon strips into half inch cuts. This allows for some shrinkage as the bacon gets cooked. Using a large skillet, fry up the bacon on medium heat until crunchy. With a slatted spoon, remove the bacon from the bacon grease. Set aside most of the bacon grease, leaving about 3 tablespoons of it in the pan. Turn the heat down to low. 3. Make sure the heat is low or the cream will dry up too quickly. 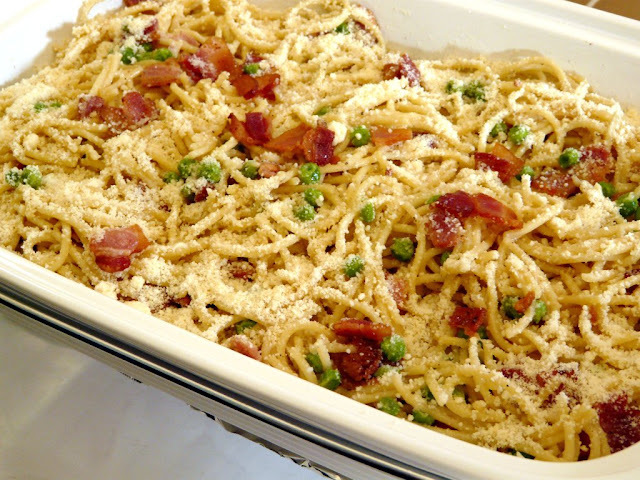 Add a little at a time of the spaghetti, peas, bacon, and cream, and pepper making sure the noodles are evenly coated. You have to taste this as you go to see if you have enough pepper. I like mine on the spicy side. If the noodles are getting dry, add a little olive oil or cream, or the left over bacon grease. I prefer to use olive oil since it's healthier than bacon grease. When everything is evenly coated, turn off the heat and transfer to a serving platter. 4. Transfer a little at a time, alternating the carbonara and the parmesan cheese. I like to use a lot of cheese in lieu of salt. Finish it off with parmesan cheese on top. Serve immediately with parmesan cheese on the side for further seasoning if desired. Seven bacon strips cut up into half inch cuts.